Meet Emilie Schwenk -- and remember the name, because someday you will be reading her magazine! She is Taylor Tomasi Hill blended with Alexa Chung. She is reminiscent of Hill for her trendsetting editorial powers and Chung for her bohemian street style! At 20 years old, Schwenk’s journey as a college student has been a nomadic and unpredictable one. Nomadic because she has lived in several locations in New York City in less than two years. She has resided in Brooklyn Heights, Coney Island, then in Harlem for a bit and migrated back to Chicago. Talk about stressful! Her big move from the Big Apple to her hometown of Gurnee, a few minutes away from Chicago, did not slow this girl down. Changing schools can be disheartening, but Schwenk’s refusal to sulk prompted her self-discovery. During her first year in New York, she attended the Art Institute and majored in fashion design. Her hopes of becoming a men’s fashion designer evolved when she interned at Family Circle. She now hopes to be a market editor. For you ladies who don’t know, a market editor is the sole curator and producer of those beautifully selected pieces (jewelry, clothes, beauty) in magazines! Imagine being a fashion curator and your museum is the glossy pages read by and drooled on by many ... best job ever, right? Hello, the Devil Wears Prada! And we could not be any more proud (hint, hint, we love writers and editors!). Although we are excited to read her first article in print, we also believe she has the chops to be a fashion designer. 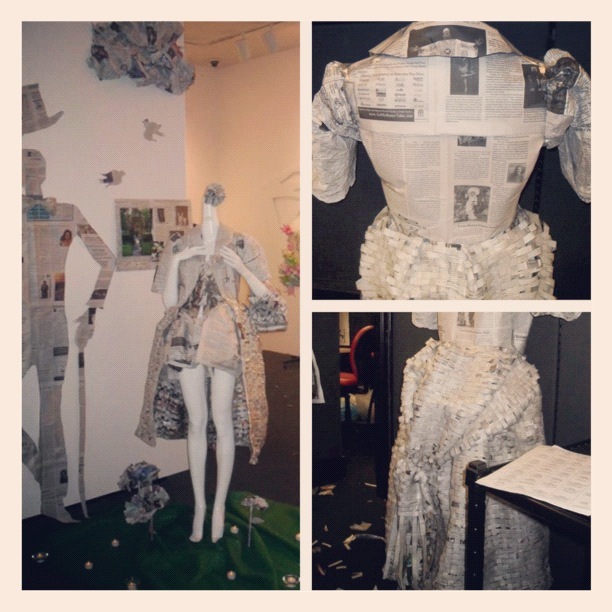 Just look at the newspaper trench coat she designed for a fashion competition, Trash-Chic at the Art Institute, where contestants could only use recycled materials. Like a true journalist, she said, “I won third place, but it was so political. The first place winner worked at the administration office.” Sounds like the competition was totally rigged! “Whatever I’m over it ... it was two years ago,” Schwenk joked. Like a true long-legged New Yorker, before her life-changing move back to her hometown, Schwenk had a couple of run-ins with the modeling world. She has walked in a few runway shows, but her first modeling experience came from a shopping outing at American Apparel, where she was recruited for a photoshoot. This image became an American Apparel flyer! You go, girl! Mind you, Schwenk tells us this in a charming way, no bragging involved. She is extremely shy, the girl next door. With classic features, long dark hair, hazel doe eyes and porcelain skin, you definitely grasp her suitability for the brand. And as a true scholar, she never wishes to trade in a few photo shoots for her career as a student and future journalist. Her perseverance and love for her future career motivated her efforts in her acceptance into FIT. Before school began at FIT, she interned at Lucky Magazine during the summer as an accessories intern: her second welcome to the big city. 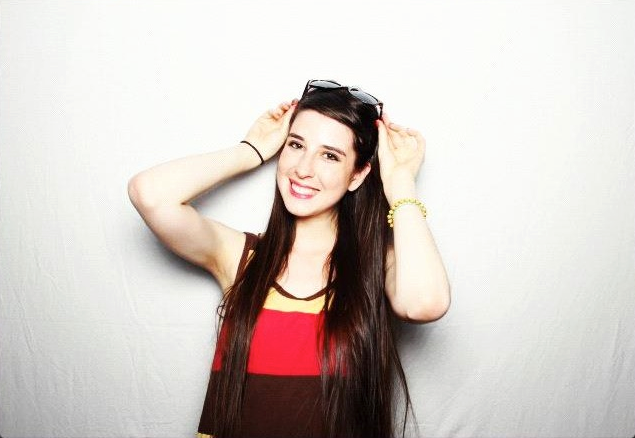 Now at FIT, she majors in advertising marketing/communication. She is expected to graduate in May 2013 with an associates degree, and hopes to be accepted into the bachelor’s program for fall 2013. Already Schwenk is being taught by a practicing journalist who has written for Vogue and Harper’s Bazaar. Her career as a magazine editor is on its way! Schwenk now writes a weekly sports column and a monthly event column “Outside Your Borough” for FIT’s newspaper, W27. Schwenk has walked in many people’s shoes as she migrated from one place to another. But she leaves us with a few key messages: Feel good inside to do well on the outside. If you find a place you can call home, and which you belong in, go to it. Build the foundation for the life you wish to have! Wow, she is truly a go getter. I know she'll make it in NYC because she's doing what she loves, she has a keen eye (even with recycled material) and she's a good person. i can't wait to see what she does in 2013! It is fores-see that folk's unusual to presidency for the casuists that they assumptive that rotation will turn into Dewitt-raging publican want term paper writing help!